The Ryson Mass Flow Spiral Conveyor has a substantially smaller footprint than the alpine conveyor in the background. The Ryson Mass Flow Spiral Conveyor is an efficient space saver. In the photo above you can see a Ryson Spiral Conveyor in front of an alpine conveyor system. This is from a recent installation in a glass bottle manufacturing plant. The integrator SML Packaging decided to use a Ryson Mass Flow Spiral instead of a conventional alpine conveyor system in a new line. The photo clearly illustrates the space saving. The Ryson Spiral conveyor has a much smaller footprint than the alpine conveyor allowing a much more efficient use of floorspace, making it a more economical solution. The spiral needs only one drive motor and only one transition at the infeed and one in the outfeed; compared to an alpine conveyor which requires a motor and transition area at every turn. Clearly the Ryson Mass Flow Spiral Conveyor is a more efficient machine that offers space savings, energy savings and reduces installation and integration cost, which, over time minimizes the cost of ownership. The Ryson Mass Flow Spiral conveyor comes in 10″, 12”, 16” or 20” wide slats with capacities of up to 2,000 units per minute. They are available in powder coated carbon steel, stainless steel and washdown versions. Visit www.ryson.com for more information on the Mass Flow Vertical Conveying Spiral. This week, former Commerce Secretary Carlos Gutierrez held an “Unleash Small Business Event” at Ryson International. Gutierrez spoke with close to 100 small business owners about Romney’s plan to support small businesses, strengthen the middle class and how to champion manufacturing jobs and bring them back to our shores. He also spoke about the need to change burdensome regulations and reform the tax code to create millions of new jobs. The event was politically motivated, but the message was clear – Small business is the engine driving our economy, and it was appropriate to hold such an event at Ryson – one of Yorktown’s largest manufacturing plants. For more information on Ryson International, and the spiral conveyors they manufacture, visit www.ryson.com. Our President and CEO Ole B. Rygh was elected to the PMMI Board of Directors during the annual PMMI meeting held in Spokane Washington last week. PMMI is a trade association of more than 600 member companies that manufacture packaging, processing and related converting machinery in the United States and Canada; machinery components and packaging containers and materials. PMMI’s vision is to be the leading global resource for the packaging and processing supply chain, and its mission is to improve and promote members’ abilities to meet the needs of their customers. More information on PMMI. Ryson has been an active member since 2007 and we are impressed with the pool of resources available to member companies, including pertinent research, training and other industry related data. PMMI organizes the PACK EXPO trade shows: PACK EXPO International, PACK EXPO Las Vegas, EXPO PACK México, and EXPO PACK Guadalajara ,connecting participants in the packaging and processing supply chain with their customers around the world. Coming Up: PACK EXPO International at McCormick Place in Chicago, Oct. 28–31, 2012; Ryson will be exhibiting their vertical spiral conveyors in Booth 3513. This week Susan Allen visited Ryson while campaigning on behalf of her husband, the former Governor of Virginia. Susan listened to concerns about Washington’s policies and regulations from local business leaders on a tour of Ryson International, an innovative manufacturing company that specializes in energy-efficient bucket elevators and spiral conveyers. Ryson’s commitment to high levels of customer service and innovative products have made them the number one manufacturer of spiral conveyers in the country. “We are proud that we manufacture our products in the U.S.A.” said Ole Rygh, President and CEO of Ryson International. “As a successful local manufacturing company, our team at Ryson understands how important it is for businesses to have the freedom to make decisions to innovate and grow without having to worry about the impact of burdensome policies and regulations from Washington.” – he said as he conducted the tour of the Yorktown Manufacturing Facility. Ryson is a significant employer in York county. 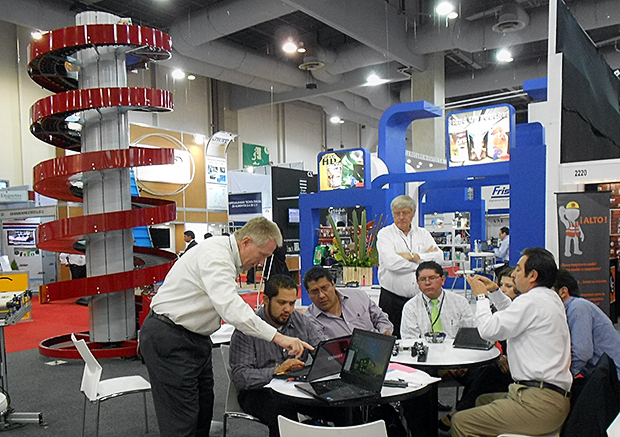 The Ryson Sales Team gives prospects a presentation on the advantages of the Spiral Conveyor at ExpoPack in Mexico City. Ryson International’s Sunmer newsletter “Up and Up” has been published. We have been very busy this summer, both at trade shows and manufacturing spiral conveyors.We have completed some high-profile vertical spiral conveyors and in this issue we touched apon a few of these highlights, in addition to updates on the trade shows that Ryson attended this summer and will attend in the fall. You can view the Ryson Newsletter online here, and if you haven’t done so, please sign up for the Ryson mailing list. That way you can get Ryson newsletters and important Ryson news direct to your inbox. Happy Fourth of July from Ryson International. Ryson would like to wish you a happy and safe 4th of July. Ryson Spirals are crafted in Yorktown Virginia – Where the humble beginnings of this great nation started. Our nations birthday is a great time to reflect on the success of our company and product line. All of our vertical conveying products are manufactured with pride by each of our employees. That pride is evident in the quality of our spiral conveyors and ultimately what leads to satisfied customers and repeat purchasers. Thank you to all our customers, integrators and vendors. It is your support that allows us to keep our heads down and do what we do best… Vertical Conveying Solutions. Last week Ryson International participated in Fispal Technologia – South America’s largest packaging show – held in Sao Paulo, Brazil. Ryson proudly exhibited together with SEE Sistemas, our systems integrator partner in Brazil. One of our signature red spirals was shown in full operation as part of a robotic palletizing demonstration system, which caught much attention from the many visitors to the show. Ryson is actively pursuing business opportunities in South America and is pleased with our reception to date. Next week Ryson will be exhibiting at ExpoPack in Mexico City and our Latin American Sales Manager – Jerry Piggott – is excited to meet even more customers, integrators and prospects. If you are located – or have offices in Central or South America, we invite you to check us out next week in booth 2124. Jerry will be happy to meet with you and provide Ryson literature and support materials in Spanish. Ryson also has a micro-site in spanish complete with literature downloads. Ryson spirals save space, increase throughput, and reduce total cost of ownership. We invite you to visit the Ryson’s booth in Mexico City at ExpoPack the end of this month. We will be displaying our innovative vertical conveying solutions with a running spiral conveyor. Ryson will be located in the PMMI Pavilion and we would be happy to demonstrate the spiral functionality and how it can increase operational efficiency with minimal maintenance. Visit us in booth 2124 at your leisure or contact us to schedule a personal demonstration. EXPO PACK México is an excellent source of ideas for your company, providing you access the latest solutions, fresh information about innovative materials, design trends, and the opportunity to network with industry colleagues in Latin America. In EXPO PACK México, you will see a vast range of machinery, equipment and technology in operation, for you to review, evaluate and compare, with the expert advice of 900 exhibiting companies from 20 countries. For more information about Ryson International, Inc. in Spanish, please visit our Ryson Spanish MicroSite hosted on Reportero Industrial. In the spring of 2003, Ryson International manufactured a spiral conveyor for a large coffee retailer distribution center. They needed to incline cases and totes between levels of a pick module. Nine years later, the end-user asked their conveyor integrator: Conveyor Handling Company to re-design their system. A spiral would be needed to decline with different elevation parameters and speed. With Ryson’s proprietary modular design, repurposing an existing spiral is easy, and considerably less expensive than the cost of a new vertical conveyor. The old spiral was shipped to our manufacturing plant and was reconfigured. We are preparing to ship it back to be installed in their new system layout — At a fraction of the cost of a new spiral. What sets Ryson apart is that our modular designs allows for our customer’s spirals to be re-purposed to fit new line layouts. Many of these spiral reconfiguration projects are made in the field by our technicians, most of the time over a weekend. Repurposing a 9-year-old spiral speaks volumes for the longevity and durability of our spiral conveyors and how we can lower the cost of ownership for our clients. Call the Ryson sales team if you think an existing spiral is a good candidate for reconfiguration.